This page will discuss the problem about low disk space on Server 2003 C drive and share the method to make space on C drive. Download IM-Magic Partition Resizer Server to resize C drive when it is running on low disk space on Windows Server 2003. 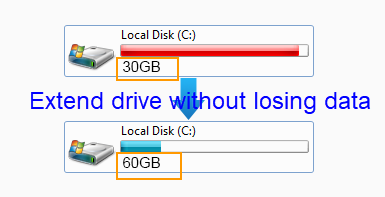 Is it possible to make space on C drive when it is running out of disk space on Windows Server 2003? Probably, you have different solutions, but professional partition software IM-Magic Partition Resizer Server provides an easy and safe way to reallocate disk space to C drive without repartitioning hard disk. As specialized partition software for Windows Server, IM-Magic Partition Resizer Server allows you to extend partition, shrink partition and move partition so as to reallocate disk space to the partition that runs on low disk space . Download, install and run IM-Magic Partition Resizer Server on PC. 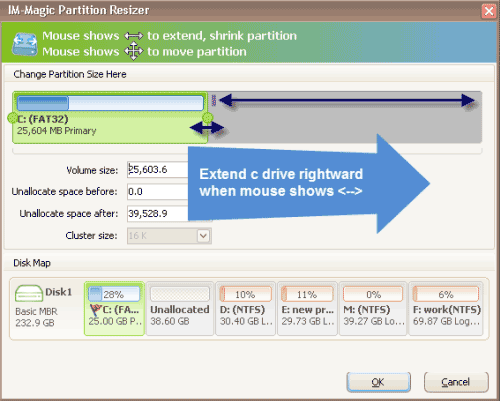 Right click a partition that has free space and select "Resize/Move". You should move the unallocated space close to C drive. Then, right click C drive and choose "Resize/Move" option. Extend C drive by moving the arrows and then click "Apply" button. "C drive only has a few GB free disk space left, so I want to reallocate some space to C drive. But I don't want to repartition the hard disk. My PC is running Windows Server 2003 operating system. Can you tell me how to make space on Windows Server C drive?" "I installed a virtual machine on my PC with Windows Server 2003 OS. Now, the C drive is running out of disk space in VMware. I want to look for a method to extend C drive on Windows Server 2003 VMware. Can anybody give me some advice?" For low disk space problem on C drive, the best solution is to extend the C drive space. You can extend C drive on Windows Server 2003 either by relying on third-party partition software or running Diskpart command. Windows 2003 Diskpart command can extend C drive if it is non-system partition with NTFS file system. If Diskpart failed to extend C drive, professional partition software IM-Magic Partition Resizer Server can meet your needs to increase the size of C drive effectively and efficiently. Windows SBS 2003 is a type of Windows 2003 series. IM-Magic Partition Resizer Server functions as magic when you use it to extend C drive on Windows SBS 2003. This partition software provides secure way to reallocate disk space to C drive without touching the operating system or disk data, so you can completely rely on this software without worrying about system crash or data loss due to partition resizing. If the PC shuts down due to unknown reasons in the partition resizing process, it will not cause any damage to the system or the hard disk.